"This particular segment of the Jewish society who are preparing for the coming Temple refer to Numbers 19 where the Torah speaks about the ashes of the red heifer, mixed together with hyssop, cedar wood and scarlet ribbon. This ordinance was required for the operation of the tabernacle, the first and second temples and the next temple. The ashes, mixed with "living water" purified those who had come in contact with something or someone dead". Somewhere on the streets of Jerusalem there walks an expectant mother that has made a decision to have her baby raised in a bubble. This is not the "bubble" used in some hospitals to protect a child without a working immune system from the germs of this world. This is a "halachic bubble" which will be used to protect the child from being defiled by one of the innumerable forms of impurity spelled out in the world of "Halacha", the Jewish law. The purpose for this isolation of the newborn child - a child that is a kohen , a descendant of the priestly tribe of Levi - is so that he will be able to handle the ashes of the red heifer and thereby purify the Jewish people, enabling them to engage in the services of the Temple. There are Jews that believe this is all part of the preparations for the building of the Third Temple. This particular segment of the Jewish society who are preparing for the coming Temple refer to Numbers 19 where the Torah speaks about the ashes of the red heifer, mixed together with hyssop, cedar wood and scarlet ribbon. This ordinance was required for the operation of the tabernacle, the first and second temples and the next temple. The ashes, mixed with "living water" purified those who had come in contact with something or someone dead. Since the ashes of the red heifer have been lost from around the time of the destruction of the Second Temple, Herod's Temple at the time of Jesus Christ, everyone, according to Jewish thought, is in a state of impurity. This constitutes a major halachic obstacle for those interested in either renewing sacrifices or rebuilding the Temple. The above information helps to bring into better focus, and actually explain why the birth last year of a red heifer at Kfar Hassidim caused such a stir among certain religious circles. That red heifer, "Melody", has been disqualified owing to the white hairs found on the heifer's tail. But even the existence of the heifer pushed the various groups dealing with the Temple into a quandary. The quandary was created when those preparing to build the third temple realized they had a red heifer and no one in the state of purity required to handle its ashes. Then along comes Yosef Elboim, a rabbi at Jerusalem's Yeshivat Torat Habayit, a yeshiva that deals exclusively with laws pertaining to the Temple. It was from this yeshiva and Rabbi Elboim that the idea arose to establish a compound where babies whose fathers are kohanim , of the priestly tribe of Levi, would be born and raised until bar-mitza age. A number of women have expressed interest, in fact, one woman in particular has volunteered and the project is due to get underway in the very near future. The compound, which will be built in such a way - including elevation from the ground - so that they will be assured that impurity can not be transferred to the children. The compound, to be located outside of Jerusalem, will eventually have a number of babies "enrolled." Its where -abouts not to be disclosed because they are not interested in the media exposure. The children will remain in the compound until a red heifer is found, after which they will eventually prepare the mixture that they believe will purify the Jewish people and enable them to go onto the Temple Mount and enter areas that to date have been halachically off limits. (chapter 3). The Mishna describes a setup where courtyards in Jerusalem were built on hollow rock, through which impurity did not pass. This pattern would be followed in the new compound. This would enable pregnant women to go there and give birth to their babies. The mothers would wear special clothing to prevent impurity from being transferred to the children. Here the mothers would raise their children. The children would then be brought to the Temple to prepare the red heifer solution. There are many Jews that believe this group is crazy, among them even some of the Orthodox community. The "non-believers" say there are more important things to do today in Judaism. But for the small group dealing with Temple-related laws and activities there is nothing more important. For students of Jewish messianic developments of the last few hundred years there is the awareness that in the past there have been a number of moves to look into the feasibility of bringing sacrifices to the Temple Mount. These would include attempts through prayer, intense study, and learning Jewish laws pertaining to the Temple. This approach - participating in actions aimed at the speeding up the redemption - has to a large extent been incorporated into normative Judaism, with most observant Jews believing that their prayers, study and observance of the mitzvoth , the Jewish law, would do something to further the process. Interestingly, what sets the plan for the compound for kohanim apart is that it is not being done in an effort to bring the redemption closer, but rather as practical preparations for a redemption which those involved in the plan seem to believe is just around the corner. They are actually putting "feet's" to their prayers. Making plans for rebuilding the Temple is a logical extension of "religious Zionism", which is premised on the idea that one does not wait for redemption but takes an active part in it. It is the idea that one doesn't sit back and wait for God to lead the people back to Israel, but inserts oneself into the historical process. There have been two approaches to Jewish eschatology in the past and the present. The first approach was brought down by Rashi: that the Temple will descend from heaven, kind of like a flying saucer, and land in Jerusalem. This is the view taken by the "hassidim", the Ultra-Orthodox. As these hassidim follow Rashi, an ancient Jewish scholar, they believe that the rebuilding of the Temple is supernatural. They believe the Temple will fall onto the Temple Mount and everything will be taken care of. It is because of their beliefs that they look at these activities to physically prepare for the Temple as crazy. The other view is that of Maimonides's, another honored Jewish scholar. This view holds that the Temple will not fall out of the sky but will be built by the Messiah. In fact the view goes a step further, maintaining that the Temple will be built before the Messiah. In recent years a number of groups have sprouted up dealing with the Temple - everything from spreading information on the Temple to building the utensils that can be used in the coming Temple. Leading this effort is the Temple Institute here in Jerusalem. They have prepared the utensils, the priestly garments for the priest to wear, and are teaching the men the priestly duties for the operation of the Temple. Religious laws have been learned, utensils have been made, work is being done on procuring a red heifer. According to this mind-set, the next logical move is preparing kohanim to deal with the red heifer. These most recent plans show that the movement isn't standing in place, but moving forward. To this point in this report I have been detailing all the activities surrounding the preparations for the coming Temple. I have also tried to give you insight into the thinking of the Jewish people involved in these activities. Now, I want to share with you the true Biblical approach to the Temple, or Temples, in the end times. God's word, in Ezekiel 40 to 46, reveals in the finest detail, the requirements for the Temple that will stand in Jerusalem when Jesus Christ, the Messiah, will rule and reign from His throne which will set in the area known as the "holy of holies" (Ezekiel 43:1-7). This is a different temple than the one being prepared for by the groups mentioned above. In Messiah's coming Temple there are changes from the first and second temples, that will lend itself to true worship of the true Messiah. In addition, there are items missing from the Messiah's Temple that were included in the first two. The wall of partition, the table of shewbread, the menorah, the veil of the temple and the ark of the covenant are all missing from Messiah's Temple. Those very actively involved in the preparations for the next temple are following the instructions of Maimonides, who wrote much about the third temple. This well respected Jewish sage has written extensively about the next temple which follows the pattern of Herod's Temple. When asked by an associate of mine, the leadership of the Temple Institute said they were not following the directions of Ezekiel, but instead Maimonides. This spokesperson for this group said that they were, in fact, preparing to build a temporary Temple, one to be used until the Messiah comes to build His Temple. This scenario follows the prophetic word which calls for a temple to be built, one in which the Anti-christ, the false messiah, will set up his headquarters here in Jerusalem. The prophets say there will be a false temple during the tribulation period (Daniel 9:27), and Messiah's Temple during the 1,000 year kingdom (Ezekiel 40-46), after the tribulation and the coming of Messiah. 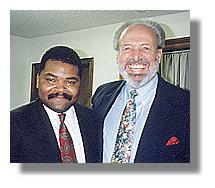 Jimmy DeYoung presently resides in Jerusalem, Israel. During speaking tours in the United States and Europe Jimmy brings with him the latest news and updates from the Middle East with a unique mix of political, biblical and prophetic insight that can't be found in the media today. After graduating from Tennessee Temple, Jimmy joined with Jack Wyrtzen and Harry Bollback at Word of Life Fellowship in Schroon Lake, NY where he spent the next 12 years in many staff positions including staff evangelist, host of Word of Life Inn, and producer of radio programs heard worldwide. For 5 years Jimmy was the Vice-President and General Manager of New York City's first Christian radio station, WNYM. During this time he was the producer and host of a daily talk program in the No. #1 media market in America. Since 1991, Jimmy and his wife Judy have been residing in Jerusalem where they are fully credentialed journalist in the second most populated journalistic city in the world. Arriving there just 3 days prior to the Gulf Crisis, they weathered 39 scud attacks. Jimmy gave live reports nationwide on several networks, during the Gulf Crisis. He remains in the center of what is considered the media "hot spot" of our time, the Middle East. Jimmy can be seen on the television program, Day of Discovery over a network of 300 television stations in the major markets of America. He is also heard weekly on radio, with reports from the Middle East, on several networks consisting of over 900 radio stations. Jimmy DeYoung is a noted Prophecy Teacher and Conference Speaker in the United States and Europe and he devotes several months of the year to this conference ministry. As a part of his ministry he has authored and produced several audio and video materials, including his best seller, "Ready to Rebuild" and his brand new 2 hour video, "The Daniel Papers". He continues to expand his ministry with the most up-to-date information on current events and their relationship to prophecy, in his newsletter "Until" and the brand new weekly audio digest, "Prophetic Prospective". Jimmy had the privilege of receiving his Doctorate from Tennessee Temple University in May of 1996. Return to "A Word from My Colleagues in Bible Prophecy"
Return to "According To Prophecy Ministries"